We are proud to introduce our new system of reaction time measurement, the Multi-Operational Apparatus for Reaction Time (MOART) system. With MOART you can employ simple reaction time tasks such as Go / No Go tasks for the study of higher centers of the brain, and more complex discriminate reaction time tasks to study cognitive processing. The system may also be used to study executive functioning through the use of an interference tapping task. While subjects are required to attend to a reaction time task they must execute a simultaneous tapping task. For countries requiring 220-230V AC 50 Hz operation, - Model 35600*C is available with localized AC mains cord. International pricing will apply. Simple Reaction Time: Choose either simple stimulus with response or Go / No Go reaction paradigm. Choice Reaction Time: Choose from multiple stimuli and multiple responses. Simple Reaction / Movement: Choose either simple stimulus with response or Go / No Go reaction paradigm with an added movement response. Choice Reaction / Movement: Subject starts from a single key and responds to one of multiple response keys based on stimulus presented. Simple Tap Test: The subject taps one key as quickly as possible during a timed test period. Complex Tap Test: The subject alternately taps two separate keys as quickly as possible for a predetermined test time. 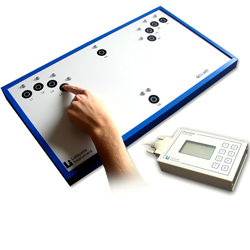 Reaction Time + Tapping Test: The subject is instructed to perform a reaction time test while simultaneously performing a tapping task. Dimensions: 21.0" x 11.2" x 2.5"
This auxiliary Touch Key can be used with our Model 35600 MOART System for more versatility. This auxiliary Foot Switch can be used with the MOART System, Model 35600 for added versatility. Push Button Remote for use with the Bassin Anticipation Timer - Model 35575 as well as the Sportimer - Model 52502. With MOART you can employ simple reaction time tasks such as Go / No Go tasks for the study of higher centers of the brain, and more. With MOART you can employ simple reaction time tasks such as Go / No Go tasks for the study of higher centers of the brain, and more complex discriminate reaction time tasks to study cognitive processing. Includes MOART Panel Only.